good morning! fred astaire is my favorite!! Morning, Joe. I have my dancing shoes on. Hey Joe - great start as usual . . . . love these old tunes. Singing in the rain . . . .wait, its sunny. Filmstruck recently added the complete Fred & Ginger films-- I should really sit down with some of them soon. It's Monday again. Therefore: "Yip yip yip!" I watched all the classic musicals from the 30s with my older siblings. Love that stuff! did fred astaire die? is that why we're doing a retrospective? yes, he did. good morning Joe! Hiya Joe and Noisers! Astaire sounded like DeNiro in that intro. at least we still have Gene Kelly? gays on the glistening lights below & above? wow. progressive picture! At one of the local movie theaters in my area labels the restrooms "Fred" and "Ginger." Who was the guitar player in the (Ad Lib) Fast Dances? It sounded like Charlie Christian. Well, at least we still have Gregory Hines. i was being amusing....i knew he long ago left this dance floor. gee .. has something happened to Barney? I remember the day after Fred died, I was interning at Hanna Barbera Studios in L.A. and someone taped a hand-drawn poster to the wall that said "Say goodbye to class." Oh dear. Al Jolson is still around, right? "Interning" being a euphemism for crappy summer job. Good morning, everybody, and welcome to the Imaginary Ballroom. @Ralphine: Barney Kessel on that one. imaginary ballroom is a great name - should be a thing. ...or mabey xanadu was that thing. 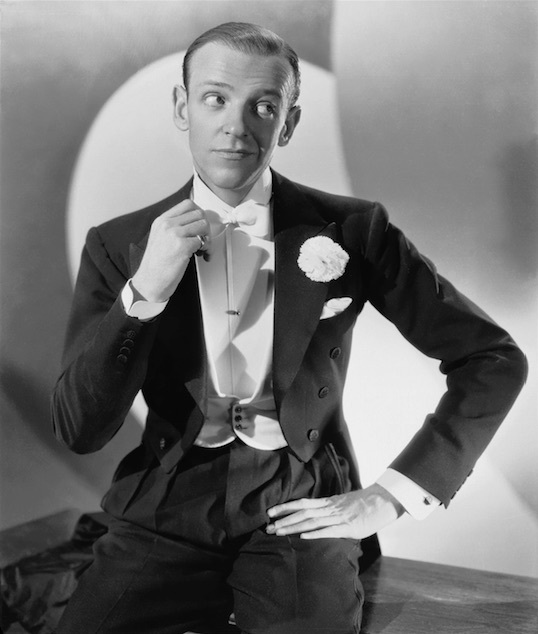 so, did we finally lose fred astaire? love the tribute! Anyone ever see Ghost Story? One of Astaire's last films, and a surprisingly effectively creepy one. Hi Joe! I have fond memories of watching Fred Astaire movies in college. I love this era, musically, and Mr. Astair was a prince of the time. Is there a woofmoo channel with this type of programming? @Itzall You should check out Uncle Michael's show from last week-- all music from 1939. Hey all! Good morning Joe!! Never got to Fred Astaire until I saw "Shall We Dance" when I was a sophomore undergrad. I read somewhere that George Gershwin's last words were "Fred Astaire." The Towering Inferno is the worst Fred Astaire movie. Dear The Oscar, thank you, I will! I'm not familiar with Uncle Michael, is that the name of a weekly show or the DJ? And good morning, all- today is my dear wife's 35th anniversary of her life sentence with me, no time off for good behaviour. Looks like my mother was wrong after all. Dear melinda y The Oscar, thanks, looks like I have more musical delights to explore! And you too, Walt. Uncle Michael's show "airs" Fridays at noon on the Drummer stream, so it's not on the FM dial. $50 American to the first person who can tell me the SPECIFIC origin of the term "landline". Wrong guesses have to bump their pledge to the station by $20. Takers? RETRACTION: Doh, I forgot about the Googles you can use. Nevermind. Dear cory, thank you, I am agog that the time has passed so quickly. @Itzall Ablurr ~ were we thinking about something other than telephone lines connected to a central hub by visible wiring? like, who coined the phrase or something? Linda Lee, color me impressed. I believe you may have worked in the Bell System at some point, is that correct? Really enjoying the whole show so far, Joe, especially this set. Thanks for brightening my Monday. My pleasure, Hillary! Thanks for saying hello. "when will i see you again" ~ so pretty. @Au pair Evie: Lovely! Glad you're all here with me. Hey Joe, listening and packing. Who said men cannot multitask! .. right into 'Superstar". perfect! Dang, but this is a good show! Oh man, great pics in music Joe, it is helping me through this boring task I have to do. @Itzall-I always thought it was "Lan" line and it had to do with "local area network". Is the stream constantly cutting out for anyone else? Hi Wild Neil, yes that is correct. "LAN" was bastardized to "LAND" because most people either heard it wrong or just thought it meant a hard line into the home, as opposed to a wireless (I guess "not of the LAND?") network. Oh, man, Marcia Griffiths is wonderful. Haven't heard her stuff in a while. Wow, I guess landline doesn't really make sense if you think about it, I sort of remember LAN now that you mention it. What an odd name, Chip Wickham. It makes me think of plaid and manicured golf greens. Holy crud am I tired. Happy Monday to you, Alex! Remember that metal group, Twisted Pair? Hah! βrian, didn't they tour with Packet & The Nodes? @Linda yes, I associated LAN with computers rather than phones. Back in the day, they toured with the Acoustic Couplers. Chip Wickham sounds like he should be a friend of Wink Martindale. No relation to Chip & Pin. Arm wrestling match: Twiggy vs. Nico- winner? I didn't know Twiggy "sang". Now Jean Shrimpton, she could sing. This tune was originally recorded by the trio Wink, Chip & Bob. When Bob went solo he did his own version. he wasn't a fashion model, though. WHA? This isn't Buckner & Garcia!! Pac Man fever! I remember hearing this when it came out. Cheers for the Bob Luman! I like that a group called "Today's Sounds" recorded "Pac-Man Fever" IN 1996.
hi Jon! 8 bit yes. songs about video games, probably not. Pac-Man sounds like he's drunk. Can't believe how much this Buckner & Garcia cover sounds like Mistrial-era Lou Reed !!! As long as we’re talking about Buckner and Garcia, they rerecorded the whole “Pac Man Fever” album for CD release or digital release since the original record company that released the original album is retaining rights. So if you have he LP and the digital version they are two different versions of the same album recorded at different times. Pac Man Fever is covered under the ACA. Oh please, no chiptune show for longer than 1 hour. Wow! The Klark Kent 10" got a lot of airplay back in the day. I don't have this Klark Kent single. I have the 10" EP! Love the Klark Kent!! Theme song from I.R.S. Cutting Edge. "Don't Care" was played a lot on the late, great WPIX in NYC. I think "Too Kool to Kalypso" is KK's finest hour. Apparently at a record company function, Stewart Copeland led around some guy, introducing him to everyone as Klark Kent. I wonder how many people believed him? Joe. You are saving my life. @Uncle Mike I have that one, too! It's shaped like a K. I was a Copeland fanatic. Rumblefish soundtrack is great. My college buddies introduced me at parties as Kent Dorfman, the fat, drunk and stupid guy from Animal House. Stewart Copeland makes a guest appearance on the Amazon show "The Grand Tour". Oddly, he didn't seem comfortable with the Brit audience, or maybe he's just an obnoxious person. @crateslinger: If you believe his bandmates, he's the most obnoxious one of the three. Has anybody ever Hoof & Mouth'd this? Seems like a McGasko special for sure. He actually comes off as pretty obnoxious. He keeps interrupting the hosts and the other guest - the drummer for Pink Floyd, whoever that is - who seems the perfect gentleman. And he was not very clever or funny. Whatever, just my impression. I only say something because he I think he embarrassed America. When KISS scandalized the rock world by going "disco." Gasp!!! Aw maaaaan! I missed the Klark Kent. Dammit! I was a Kadet in the Kiss Army!!! @ John in BK - and with no makeup! Personally, I was horrified. @Greg: I'll do it only if Sheila B. sings it with me! Let's get her on the red phone! Gotta give Paul Stanley props for getting up to those high notes! Paul Stanley was a rock star. I saw Paul Stanley at Electric Lady Studios when my best friend worked there in the 80s. He was a nice fellow. WHOEVER Nick freaking Mason is?! @Krys: He’s probably the only nice guy out of the KISS armada or whatever they call themselves. That's an Erdington phone number. Sorry Uncle Michael. My immature punk rock ears were immune to the Floyd and I still have not done the research. Not proud. Just sayin. Has anyone called this number? Well, Nick Mason is a guest on the Amazon show "The Grand Tour", and he comes off as the perfect gentleman. This sounds like ELOs first album. that was a great set, joe!! thank you!!!! Oh, FWIW when I was in high school my girlfriend dragged me on a “special trip” to specifically pick up that Klark Kent single from Record Runner. Oh what fun! Derrick Bostrom is a solid name for a solid drummer. @melinda - One other time, I came to meet them at a bar and they told all the women they were with that I had had an accident and there was a metal plate in my head, so don't stare at it, makes him self-conscious. So I wound up getting the perplexed stares all evening. Whoa-- would NOT have guessed that was the story behind that Pacman cover! I only wish to say that I endorse this set. That dude always whistled in their tunes. Even though I know what the song is called, I can only hear him say "Desiccated in the bushes." Holy cow southern rock on FMU! Ken wasnt joking the other day!!! Wow -- this is a musical blind spot for me. I think Molly Hatchet's cover art led me to believe their sound would be more metal than country. Interesting! I guess the Trump years will bring southern rock and prog back to WFMU. I saw Kiss on the Lick It Up tour. I did not like them. Still don't. Blondie did a disco song, Heart of Glass, amongst others. They rocked! Molly Hatchet reminds me instantly of vomiting Rock-n-Rye on a culm bank in -15 degree weather. People have been clamoring for southern rock? @John: I think the Van Zandts would approve. If "Free Bird" takes the gold and "Green Grass and High Tides" the silver, maybe this gets the bronze? Did not know Gators played boogie guitar! @Joe Ha! "Looks like that Yankee drunk his fill." Rode my bike to the beach yesterday. Somebody named Toby Keith (I think that's it) was playing. It was a weird scene on the boardwalk, a sort of beach version of contemporary cowboy. Red white and blue bikinis and cowboy hats. Winter Bros- if The Allmans fired Gregg replaced by Randy Newman. @SeanG -- you beat me to it! Bring on the Teeth! Not that my beach story has anything to do with anything, just this southern rock set reminded me. If Clay Pigeon wants to kick things into high gear, he can open his show with "Flirtin' With Disaster." You could put these lead guitar parts in any Southern Rock tune and they would fit. is there a certain scale that these southern rock guitar solos are in? all so similar...is it just key? Southern Rock? How about The dBs? or Let's Active? or REM? Would the NRA accuse Skynyrd of being soft on gun rights because of this tune? You are seriously winning Monday right now, Joe. Pretty clearly, the genre known as Southern rock differs from rock from the South. Would the Meat Puppets be considered Southwestern Rock? They did a great cover of Nationwide by ZZ Top. @Mark in Toronto: You read my mind! Black Oak Arkansas with Jim Dandy. Ha! @JimH: I read a list of Southern Rock online that included "Fables of the Reconstruction" and that didn't seem right. please, oh please, please please please DO NOT PLAY THE DEVIL WENT DOWN TO GEORGIA! VanZandt hated guns, that's why pistols 'n bullets are only the main cover art on not every one of their records. and i’m referring to the classic bright and pretty ones. like the allman’s “pretty” songs. @Jim H Those groups are FROM the South, but the Southern Rockers ARE the South. @Ashville Jon: Don't worry, you're safe! I'm so ignorant of Southern Rock I thought Little Feat were from the South. Thanks, John. I went to high school with the dBs. Chapel Hill was all about the boogie-ocracy when I was there. Believe me, I know. CMT will be showing a pretty swell doc. on LS sometime soon. It pretty much ends in the swamp crash. Little Feet; did they do that song "Short People"?!? @Hughie-I consider the NRA to be soft on gun rights. Don't forget Fabio's favorite! The Allman Brothers! I'm also partial to Blackfoot. Four songs in and this is the first harmonica solo?? Just pulled out my WFMU Skynyrd Flaming Plane Pen to use. @Jim H - I'm in Chapel Hill now. Funny to see legendary figures from my record collection like Peter Holsapple and Mac McCaughan at places like Trader Joe's. Oh, if you are going to play harmonica, might I suggest you be the first WFMU DJ to play some Blues Traveler? @Wild Neil - wow, you really love guns! @michael: Ha ha ha! @John: It definitely needed reacting against and I'm glad they did it. Armed checkpoints give you the opportunity to explain yourself several times a day. As a record store veteran, few bands were as consistently misfiled by new employees than the Marshall Tucker Band. Poll: High Tides or no High Tides? I have the Outlaws' first LP with me, but I can play something else from it instead. Such a LOOOOOONG song. Please another, Mr. Joe. High Tides is pretty long. @The Oscar-The Marshall Tucker Band is not country rock then? It would be interesting to test out the proposition that an armed society is a polite society. Everyone would have to have a weapon though, and that could be cumbersome logistically. Wild Neil, I believe he means Marshall Tucker was often filed under T for Tucker, but it could be something else. Love High Tides. Something else would be good. I mean that it's an untenable. Heya Joe and good ol' boys and girls. and Switzerland compels all males to own guns by law. Strangely enough this MTB has me yearning for Grand Funk Railroad. I guess I'm a Northern Rock kind of guy. @rw @Neil Yeah, that's what I mean-- it took me a long time to wrap my head around the fact that "Marshall Tucker" was not a person. OK, I am done, sorry to climb up on my soap box. Wild Neil, I finally saw the 1967 Spaghetti Western "Death Rides A Horse" this weekend and let me tell you, most of those dudes were NOT very polite. Still, it was only a movie and I highly recommend it. OK, cool, no "High Tides." I didn't really want to play it, so I'm glad you agree. Last time I played it I played the 20-minute live version. @Joe Yes! That was great time for "college radio" bands. FULL DISCLOSURE: I saw The Outlaws at the Kingston Armory in '79 or '80 ?? Great set, Joe -- and wow, a rare #39 song! Greets, Joe, McGaskoes, and those caught in traffic betwixt there and here. @Itzallablurr-Death Rides a Horse sounds EPIC! I have seen THREE of these bands, two more than once. I'm having some trouble with that right now. We all did things in the 70's we aren't proud of. That was a rockin' Charlie Daniels' number (been busy at work all morning. Graci, Joe! @Hughie Harry Lime's speech from The Third Man! I used to usher at concerts, and there was WAY more pot smoking at a Marshall Tucker show than at any other show I ever worked. Wild Neil, I can't recommend it enough if you're a fan of the genre. I thought Clint was the King of Spaghetti, but damn that Lee Van Cleef was one bad MF. I need to buy the DVD now. I LOVE Barefoot Jerry and Area Code 615. Speaking of long songs, wtf was Creamo Coyl doing last night?!? No wonder Elijah never made it in the Southern Rock world; phase shifter?? C'mon, man! If Lyrnyrd Skynyrd were a band formed today, they would play Black Metal, or maybe Death Metal. thanks, Joe McG. that was fun. Well, there goes another radio show! Thanks for listening and commenting, everyone! Have a great week! Wow, I missed my hometown heroes, Skynyrd! Wow, this was from '75? Jeez. Fun show, Joe! This Outlaws tune is one of the finest pop moments in the Southern Rock canon, methinks. The guitar solo sounds almost like he's overexcited. Thanks Joe, great show! Spent 4 years living in Savannah, brought back some good memories. WFMU: Fred Astaire to The Outlaws in 3hrs.!! @Krys O - yes! One always hopes for a chance to quote it, and here finally was mine. I agree with Hughie. Total meteor. I grew up on this stuff in Massachusetts. Saw the Outlaws at Tanglewood in like 1980. More outlaws Belock can wait!!! #John in Bkln....with Twiggy in-between ...thanks Joe.